Hearthstone, Inc. and Mountain Construction Enterprises, Inc. are proud to offer an authentic hand-hewn Log Veneer, available in one inch for interior applications, or a full two inches in thickness for exterior applications in lengths up to twenty four feet. The veneer is available in heights of twelve inches, sixteen inches, eighteen inches, or the "live-edge" style. It is designed to be placed over conventional stud walls, brick or virtually any style of existing construction. Log veneer is ideal for the do-it-yourselfer who wants to add beauty and insulation value to their home. Whether remodeling, adding a den or building a new house, log veneer will add value, beauty and eliminate virtually all maintenance. 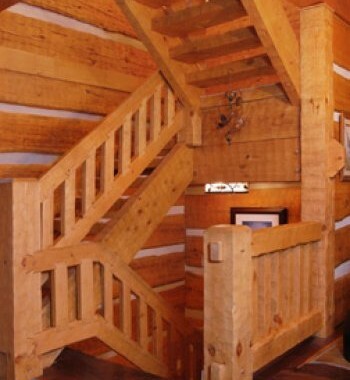 Log veneer can be installed by anyone who can drive a nail or mix mortar. Exterior veneer, both for existing homes and new construction. Where cost and insulation value are main concerns, the use of veneer is economical and, when properly installed, adds greatly to the insulation value of any wall. Garages, utility buildings, homes, stores, interior walls, gable siding. (b) 1" x 14" with hand-carved contoured edges to match our 6" x 14" Timberwright Log System. (c) 1" x variable height (average of 14" to 22") with edges that follow the random profile of the tree to duplicate the effect of our "live-edge" handcrafted homes. PURPOSE-Log Veneer is used in a variety of situations, the most common being as an exterior siding on conventional gable ends above the log walls. It is also used extensively on gable dormers, shed dormers, stick-built garages, workshops, breezeways, and on some interior partition walls. 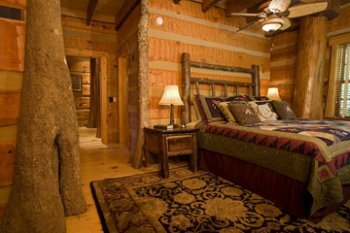 It is suitable anyplace where structural, settling, and/or cost considerations make a full log wall impractical for the intended use. vacuum-kiln drying process is exclusively available from Hearthstone. 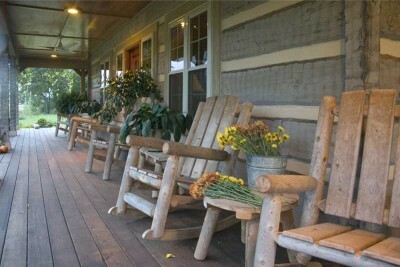 PREPARATION-Veneer is normally hand-hewn on the exposed side for the more authentic "Appalachian" look and feel. Additionally, the veneer can be Weatheraged™ to remove a little of the softwood between the growth rings, which raises the grain and makes the wood look like it has been exposed to the elements for 200 years! A rich stain will then accentuate the shadowlines and texture of the wood. (A) Frame the wall and apply 1/2" CDX sheathing or OSB. (B) Nail the veneer to the wall at the desired chink space height with casing nails, being sure to countersink the heads beneath the surface. Use galvanized nails for exterior applications. Ring-shank nails provide better holding power. An air nailer with 8d or 10d nails works just fine for ease of application and speed. (C) Stain the veneer with LIFELINE™, a waterborne acrylic stain for best protection and compatibility with the chinking. (D) Apply the PERMACHINK&trade; synthetic chinking directly to the primed and sealed OSB or plywood sheathing. Feather the edge to make good contact with the Veneer. (E) Apply a coat of PRO-GUARD over the entire wall in exterior applications. PERMACHINK™ and LIFELINE™ are available in your choice of colors. Always use a pigmented stain on exterior walls. ESTIMATING/ORDERING- Your Hearthstone representative will be happy to prepare an estimate for your project. This is done by reviewing a set of your plans or by discussing the average dimensions of your project and noting general information as to square footage of wall area, and determining the type of veneer, chink spacing, hewing, finishing, stain colors, and chinking colors. Below is a short starter checklist for estimating purposes. 1. Total square footage of wall area where veneer is needed? 2. Type of veneer desired: 1x12, 1x14, or "Live Edge"? 3. Chink spacing desired: 1", 2", 3", 4" or variable? 4. Surface prep: Hand-Hewn or Planed smooth? 5. Add Weatheraged™ finish to exposed surface? 6. Color of PERMACHINK™ synthetic chinking? 7. Color of LIFELINE™ stain? Interior or Exterior Stain? 8. Shipping options and order scheduling? Check our site and learn more about our design and construction work as Home Builders in NC. We offer services in New Home Construction and Remodeling and invite you to check out our work. We are not only Timber Frame Builders and luxury home builders, we can also help you with Remodeling construction. You are welcome to reprint this articles on your website and in your e-newsletter provided that: you don't change the article in any way and you include the by-line along with a link to this website.